Resin Coating Specialists (RCS), have recently undertaken a project with Mercedes Benz CV Liverpool. With over thirty years of experience, RCS – a renowned resin flooring company based in Birkenhead – are aware of what it takes to offer affordable, high quality flooring. Offering a project management team that remains with the clients for the entirety of the project, consequently making sure that all of the client’s prerequisites are achieved, RCS promote a bespoke experience each time. To further their customer’s satisfaction, RCS produce custom flooring that is created for each individual client, making sure that their service adheres to the allotted time, budget, and specification for each order. 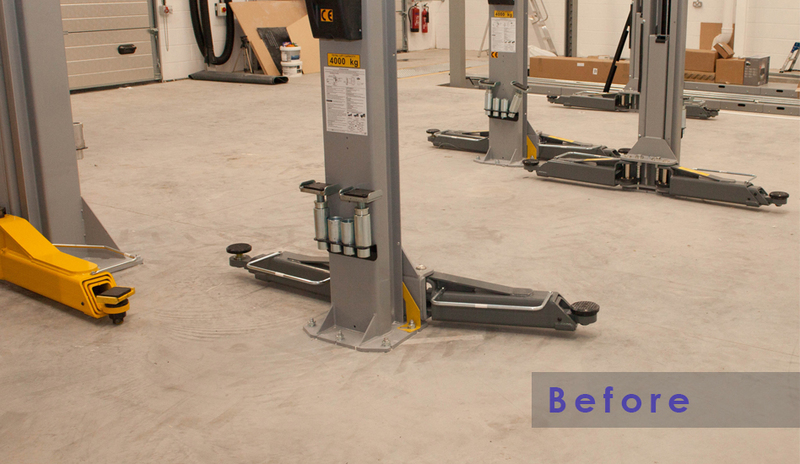 Resin flooring encompasses numerous benefits with regards to workshops. Often chosen due to its high levels of endurance, resin will remain in great condition for extended periods of time and is acknowledged for its sturdiness against chemical attack and automotive wearing. 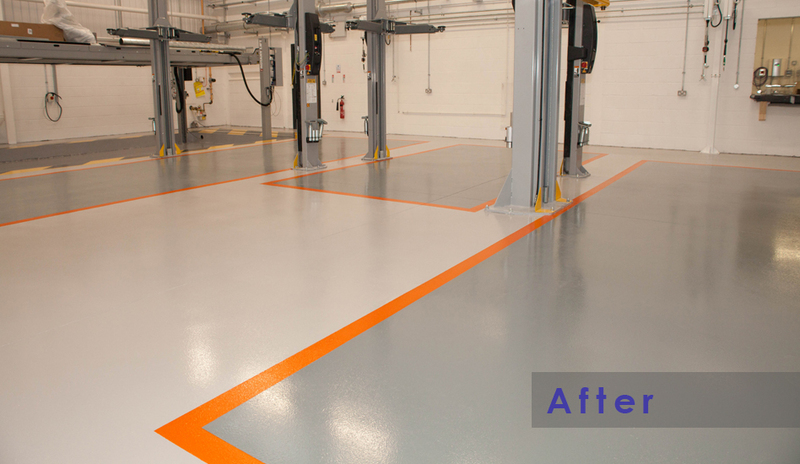 This nature of flooring also protects against chemical resistance, adhering to Health and Safety regulations; this is due to its sealed surface against various fluids that may be found within an automotive workshop. Alongside its practical advantages, resin is also an aesthetically pleasing choice of flooring. For each individual client, RCS offer numerous colours, designs, and textures in order to create the optimum level of attractiveness in a bespoke design. Also, although limited to certain environments, polyurethane systems and epoxy resins can be offered to obtain a decorative finish. This includes chemical resistance should there be any leakages, and anti-slip properties, complying with CHAS (Contractors Health and Safety). In the recent project with Mercedes, RCS worked on a newly poured concrete floor. On the first day of the project, the company used an STR grinder, a rotary preparation tool, in order to prepare the floor for the resin. 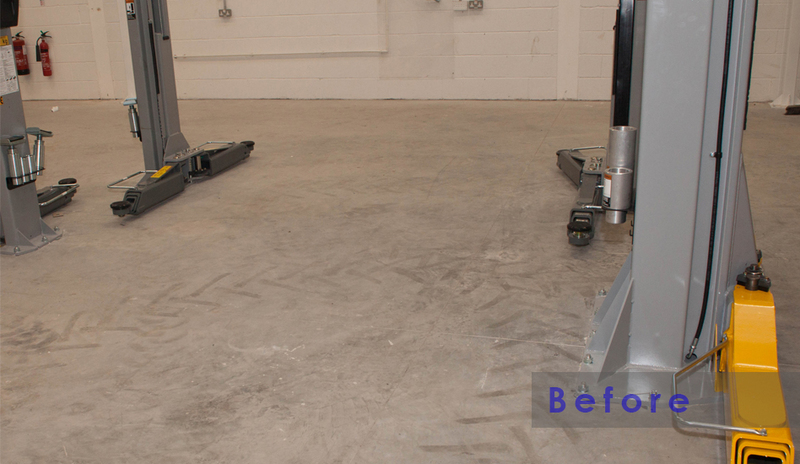 Through using this, the concrete was given a rougher surface, enabling the resin to stick more securely to the floor. After this component was undertaken, any holes that were left were lightly filled and sanded; this was to guarantee that the floor was an even level, making sure that the latter part of the project continued smoothly. Following this, a water based resin coating was applied to the floor, preventing moisture from rising up through the concrete. This is an integral aspect of the preparation as, through doing so, it prevents resin from detaching from the floor and coming apart. 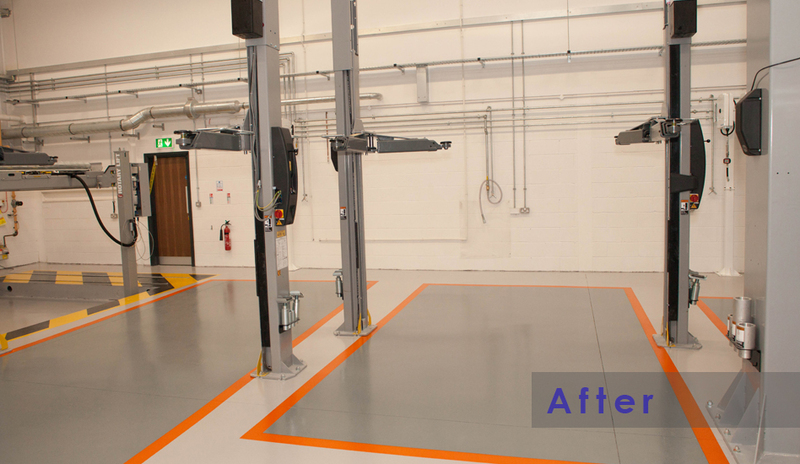 A high build epoxy resin top coat was then applied to the floor which incorporated an anti-slip property. 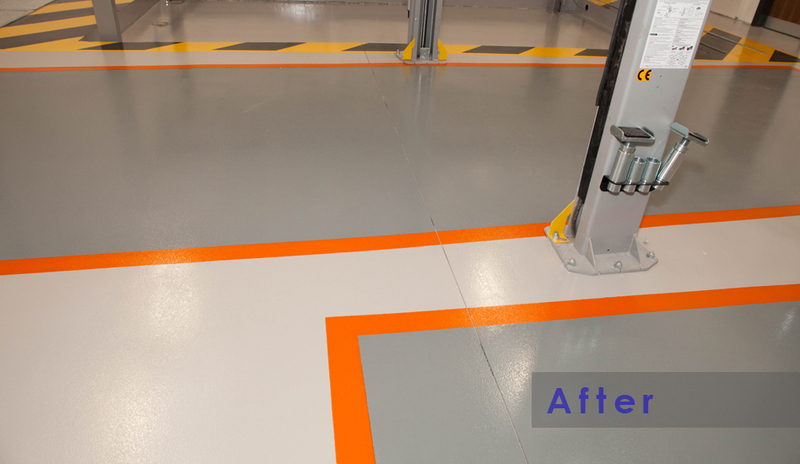 Through painting the top coat in a variety of colours, the lifting bays were able to be clearly marked out. Furthermore, a hazard was also painted around the inspection pit, again to noticeably determine its whereabouts. 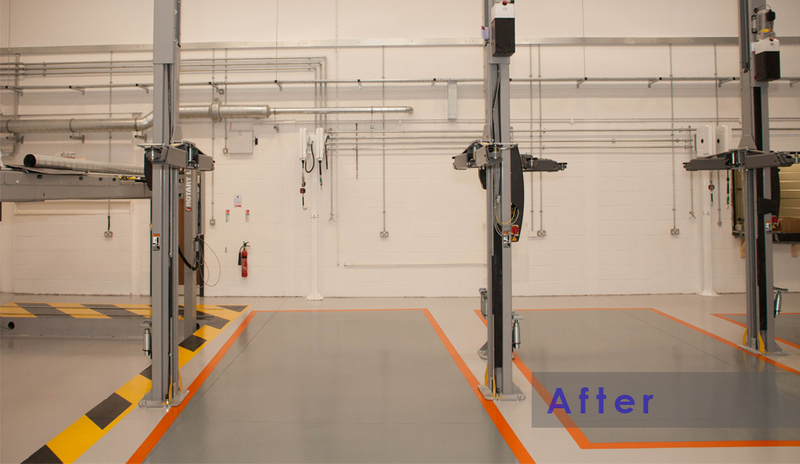 Whilst the project team were on site, they were asked if it was possible to coat a further part of the garage in the parts room, as Mercedes were impressed with the floor during its application. Though this was short notice, RCS happily undertook this task. They worked around the existing contractors, applying two coats of high build epoxy resin to the parts room floor. All work was completed on time and the customer was extremely happy with the finished floor. Along with Mercedes, RCS also offer flooring to many other clients, including retail, sports and leisure, aerospace, and education, creating flooring that suits each client’s exact needs. A company that genuinely care about their work, RCS aim to provide the finest flooring for a large variety of businesses, providing a specialised service for affordable prices. Office Address: Unit 5, Price Street Business Park, Park Street, Birkenhead, CH41 3PE.